rec. 22 April 1972 before invited audience, Camden Theatre, London. Premiere: Acad�mie Imp�riale, The Op�ra, Paris, 11 March 1867. It could be argued that Don Carlos is Verdi�s finest opera. Some might contend that accolade as properly belonging to any one of the middle period trio of Rigoletto, Il Trovatore or La Traviata. Others might point to Aida or his two final Shakespeare-based masterpieces Otello or Falstaff. What is undeniable is that Don Carlos is Verdi�s longest, noblest and most complex work. It is his grandest �Grand Opera� with a plot intermingling public and private scenes and confrontations, the conflicts of parenthood and love, and as if that were not enough, the power struggle between church and state. It calls for no fewer than six principal singers plus several comprimario roles. As it was to be a Grand Opera for the Paris Op�ra it also has a ballet sequence. After the success of his middle period operas Verdi, now affluent, retired to his estate with his wife. At the insistence of Cavour, the first Prime Minister of a united Italy, he represented his area in the first Italian National Parliament.� After that involvement he only accepted commissions if he was highly motivated by a proposal or circumstances such as that which took him to St. Petersburg for La Forza del Destino in 1862. He was very much his own man. In 1864, when spending time revising Macbeth, Emile Perrin, director of the Paris Op�ra approached him to write once more for the theatre. With the Great Exhibition of 1867 on the horizon, and Meyerbeer dead, Perrin, realising he would need a Grand Opera for the season that year, turned to Verdi. With the helpful intercession of a mutual friend, Verdi committed himself to write a work of four or five acts, with ballet. The agreed subject for Verdi�s new Paris opera was Don Carlos. He travelled to Paris in July 1866 and began composing. Schiller�s poem is a long one and so was the libretto to which Verdi composed the music. By February 1867, as rehearsals for the first night were in full progress, it became obvious that it was too long if the Parisian audience were to get their last trains home. To meet a shorter performance time Verdi reluctantly excised various sections. He made further reductions during the run of performances. At the Verdi Congress in Parma in 1969, David Rosen, an American scholar, produced a previously unknown section of the Philip-Posa duet that had been folded down in the conducting score prior to the premiere. The English musicologist Andrew Porter, in a detailed booklet essay with this issue, explains how, acting on a hunch, he visited the Paris Opera library and asked to see the score. He was amazed to discover that the pages of the music that Verdi omitted from the premiere, and subsequently thought to be lost, were simply stitched together. These excisions amount to about thirty minutes of music. More importantly, they give greater cohesion and explanation of the details of the complex story as the work unfolds. Porter copied out the missing parts. Back in London, Julian Budden, the renowned Verdi scholar, then Head of BBC Classical Music, planned a recording for broadcast purposes and including the newly discovered parts. It was the first public performance ever of the opera as Verdi originally intended. It took place before a small invited audience on 22 April 1972. For this unique premiere Budden assembled a cast of mainly French-speaking singers supported by stalwart British principals from the Covent Garden and Sadler�s Wells companies. The seminal BBC broadcast took place on 10 June 1973 after which the performance disappeared from the public domain until its re-emergence on this issue by Opera Rara. It is the first time that the recording has been properly commercially available. Although recorded second in the sequence of the five original versions of Verdi operas mounted and broadcast by the BBC, and three years after the first, Les V�pres Siciliennes, (see review) it is the last in the sequence to be issued by Opera Rara. The Peter Moores Foundation has supported the CD issue of all five. Don Carlo first captivated me via LP highlights of the 1954 recording; the four-act version, sung in Italian. This featured the incomparable Boris Christoff as the King and Tito Gobbi as the idealistic Rodrigo. I knew nothing at that time of four or five act versions, or that the opera had originally been composed and performed in French and called Don Carlos as distinct from the Italian Don Carlo. I learned of the five-act version from the Solti (Decca 1965) and Giulini (EMI 1970 - see review) recordings of what is now referred to as the Modena version. Then in 1973 came this significant BBC performance in French. A few years prior to that BBC broadcast some regular cheques from a successful book enabled me to purchase a Tandberg open reel stereo tape recorder. Using it together with my Leak Stereo 70 and tuner I recorded the broadcast, strictly for personal listening, of course. As I went back and to between this recording and my Solti and Giulini Italian language LP version� I began the long journey of understanding why Verdi always commissioned a French libretto before making each of his various revisions to this work. The metre of the French, its prosody, fits the music as the marriage of a hand and glove. One product is that the essentially lyric episodes of the work do not require such large operatic voices as are found on the Italian language recordings. That is not to imply that vocal heft is not needed from time to time; likewise the capacity for legato singing. In the later broadcasts of the original versions of Verdi�s operas, particularly the fourth, Macbeth (see review), and the final one, La Forza del Destino (see review), the BBC was able to hire singers who had sung their roles in the world�s great opera houses. This was not the case with the present performance made at a time when there seemed to be a dearth of Francophone singers of the first class. Andr� Turp, who appeared at Covent Garden as Rodolfo, sings Carlos. As he shows in the performance of the original version of Simon Boccanegra in this series (see review) he has a well supported lyric tenor voice and phrases with some elegance. That said, he lacks the ideal heft called for by the role and sounds vocally strained at times. Edith Tremblay as Elisabeth is seriously over-parted. Joseph Rouleau is a better Grande Inquisiteur, in the 1989 video recording of the famous 1958 Covent Garden production, than as Philippe where he sounds unduly nasal and forced in his great act 4 soliloquy (CD 3 tr. 6). In the confrontation that follows with the Inquisiteur, the English bass Richard Van Allan sounds far too young for the implacable octogenarian. Robert Savoie sings effectively as Rodrigue but suffers badly from the sound balance at the start of the prison scene where he is set too far back on the sound-stage to the detriment of the drama and pathos of the evolving scene (CD 4 trs. 1-4). This rear placing of the voices in a very resonant acoustic is a characteristic of the performance that I did not remember from the original broadcast, and my recording of it. It takes a little getting used to. 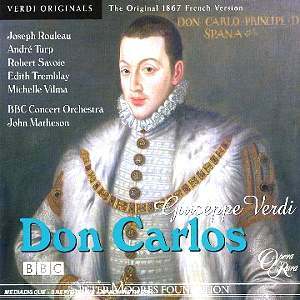 By the time Claudio Abbado�s DG recording of Don Carlos in French was issued, with the music missing from the premiere included as an appendix, I had given up on open reel. That performance, on four CDs, features a typical standard Italian-speaking international cast of opera singers in the principal roles. It does not have the French feel of this broadcast performance despite the vocal superiority of the singers. Performances in French were increasing slowly. The long-lived 1958 Visconti production and sets were replaced at Covent Garden by a production by Luc Bondy shared with the Paris Opera. This was filmed live in Paris in 1995 and issued on CD (EMI) and DVD (Warner). Although sung in French it excludes some of the music Verdi discarded before the first night and which is present on this Opera Rara issue. At the same time it uses music from the 1872 Naples revision, particularly the more dramatic form of the Philippe-Rodrigue duet in act two. It is a well-performed and sung version that does not suffer the acoustic drawbacks of the Abbado recording. In 2004 the Vienna State Opera set out to be the first to stage Don Carlos in its entirety as Verdi intended before the excisions. The production was based on the Peter Konwitschny�s controversial Hamburg staging of 2001 and recorded by Orfeo (see review). Regrettably, the production caused something of a rumpus among the audience at the start of the auto da fe, enacted in the foyer and which lacks sonic impact. Elsewhere extraneous stage and audience noise is a drawback from time to time. The difference in timing between De Billy in Vienna and Matheson�s vividly drawn account here is worthy of scholarly study with a full score, although as far as I am aware no Critical Edition has been published by the Verdi Institute. In the meantime the re-emergence of this seminal performance into the public domain is to be wholeheartedly welcomed.